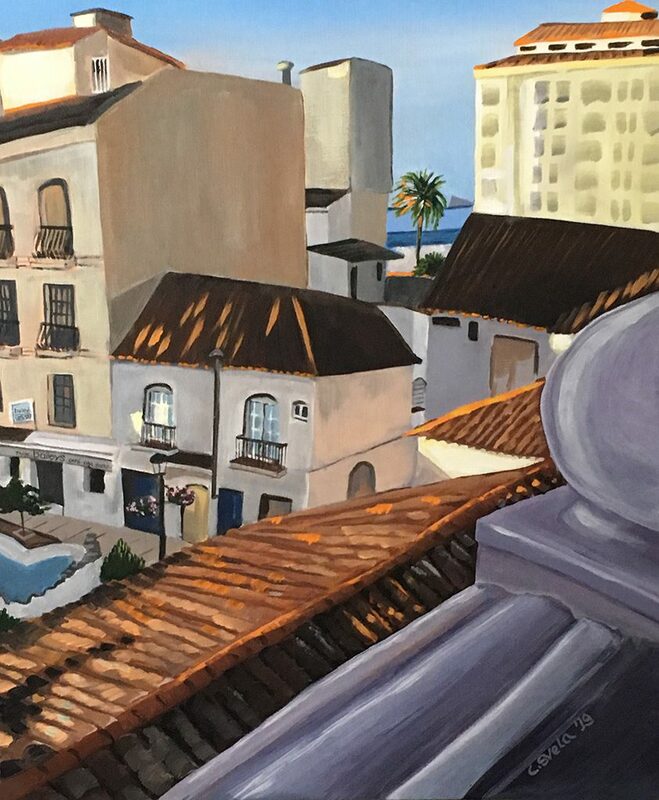 Home » Posts Tagged "painting"
This painting was inspired by the view from the balcony where I stood in the spring of 2018 when we visited Estepona, Spain. We arrived late the evening prior. After organizing the essentials and changing into fresh clothes we headed out to the nearby streets in search of a place to eat. This proved easy since most eateries open late for dinner in Spain. It was the eve of the May 1 holiday weekend, and the streets were full of bustling crowds of people of all ages—a mix of tourists and nationals. How exciting it all was! The next morning, I ran to the top of the apartment and looked out from the terrace to look upon this scene. “You can see the Rock of Gibraltar on a clear day”, we were told. And there it was in the distance. The sun had not yet made its way over the square below, just kissing some of the roof tops. And just beyond I could see the ocean, the sand and the palm trees. Good morning, Estepona! We have arrived. I was intrigued by the perspective of the buildings from where I stood. So many angles, but all pointing to the sunlit ocean and palm tree in the distance. The colours and shadows were interesting too. I played around with the oranges, creamy whites, and purple hues, changing them until I was satisfied with the end result. Autumn is a beautiful season most anywhere in the world. Cosy sweater weather, warm drinks by the fire, and awesome coloured leaves…what’s not to like? I may be a bit biased but here in Northern Ontario, the fall colours in the bush go absolutely crazy with crimson reds merging with the brightest yellows producing shades of orange against the grey rocks. What a show! So naturally, I called him and checked out his office space which had the most brightly painted walls I’ve ever seen. Marigold, bright yellows, reds and oranges! These guys really like fall colours. The challenge was to paint a colourful fall scene that would compliment the colours and not get lost or overpower. Well, I have to admit, the painting looked perfect on a bright yellow wall. 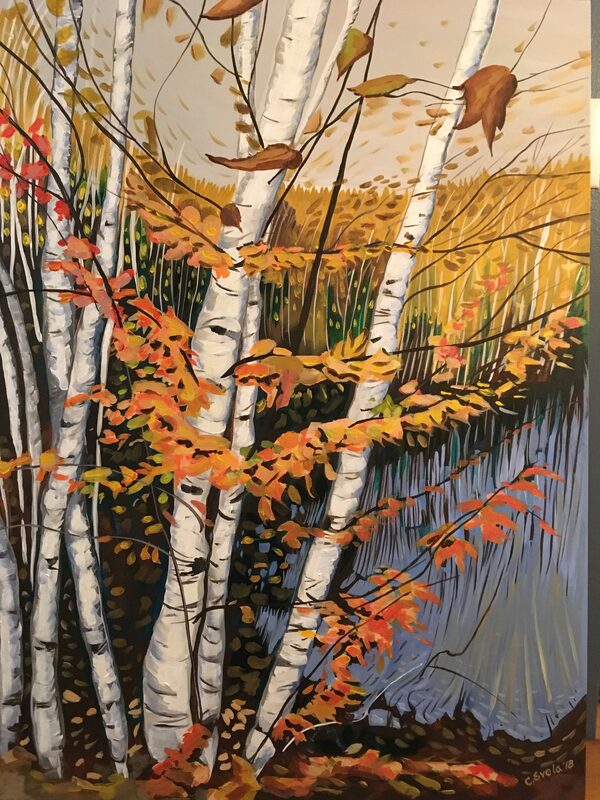 I named this painting Autumn Symphony because it almost seems like the birch tree with its branches was standing like a conductor orchestrating this most magnificent symphony. If you’ve never been to Northern Ontario in the fall, you really should add it to your list of places to visit! Last October, we were blessed with some beautiful sunny days and we didn’t hesitate to take advantage of them including some family hiking, canoeing and walks down to the lake. This was our first fall in Elliot Lake, a time I had eagerly looked forward to. It had been at least 40 years since I had experienced a northern autumn and I looked forward to the brilliant reds that we didn’t see as much in Southern Ontario. Many Elliot Lakers were disappointed in the lack of intensity and brilliance of the fall colors this year. It was blamed on the long and rainy summer and the warm fall weather that didn’t include the usual amount of frosty mornings and cool overnight temperatures. Despite that, the fall was a wonderful time, and we can’t be happier in our new home in Elliot Lake. I’ve been happily rediscovering this lovely city and the natural beauty that surrounds it. I think growing up here, I took so much of its beauty for granted. I plan to continue exploring all the area has to offer. I’m excited too, to be showing this painting and offering it for sale in the Elliot Lake Arts Club Annual Christmas Show & Sale, along with my blank note cards. It’s just the beginning. Stay tuned for more! There is a really cute, smart, funny, adorable little girl and her name is Klara. I am so lucky to be her grandmother. Klara is really lucky too because she has 2 awesome parents who love to travel. So Klara has visited more countries in her 3 young years than many adults have in their entire lives. 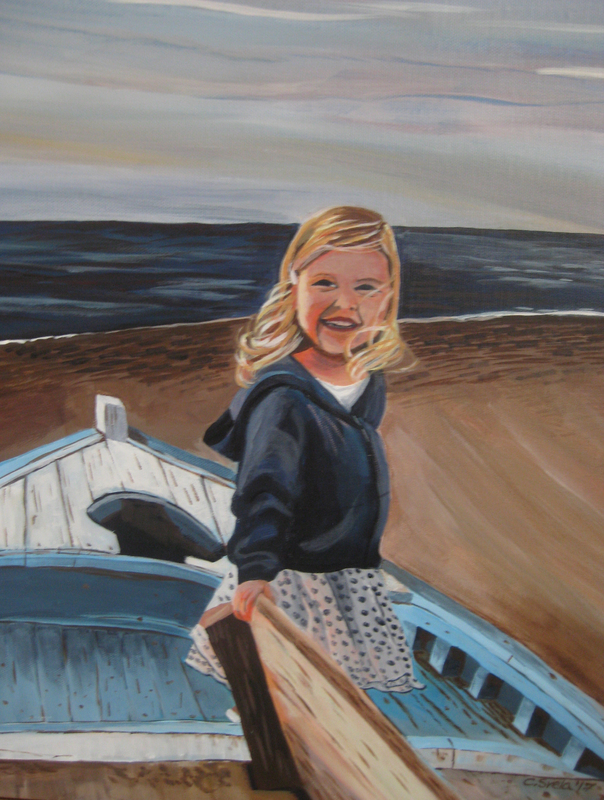 In this painting, she is standing in a weathered old wooden boat along the shore of a beach in Greece. She was only 2 at the time, though I’ve captured an older Klara in my painting. She has the brightest smile and eyes that twinkle and light up the world. I must confess that I painted her face at least 8 times before I was satisfied that it was Klara. There were times when I considered giving up. But a dedicated artist does not give up. Portraits are a true test for an artist. You have to capture what you see, so there is an amazing amount of concentration. And the ultimate thrill when you’re successful! 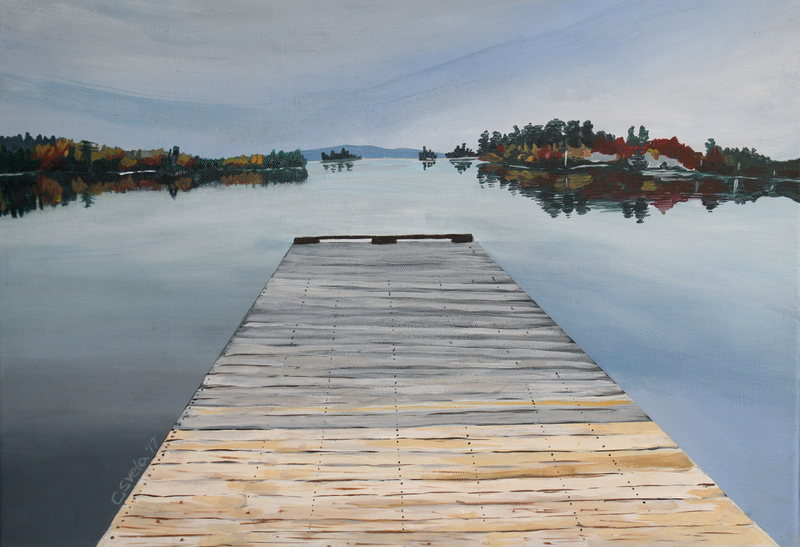 I get a little homesick or should I say “cottage” sick standing back and looking at this painting. My sister Gabie and I often go kayaking on Lake Lauzon. When you round this point from the larger open part of the lake, you approach the bay where our family’s cottage is. And the water in the bay is always calmer. If you look in the upper left, there is a boat house that belongs to the cottage. It is leaning now, because it’s support posts have shifted from upheavals from too many cold northern Ontario winters. It was built by my dad, back in a time when you were allowed to build over the water’s edge. The front end is rotting now too, so it will probably need new supports some day or perhaps it would have to be removed. It’s not really being used at all now. Well, I think it is home to a beaver at times when my sister doesn’t annoy him too much by shooing it away. 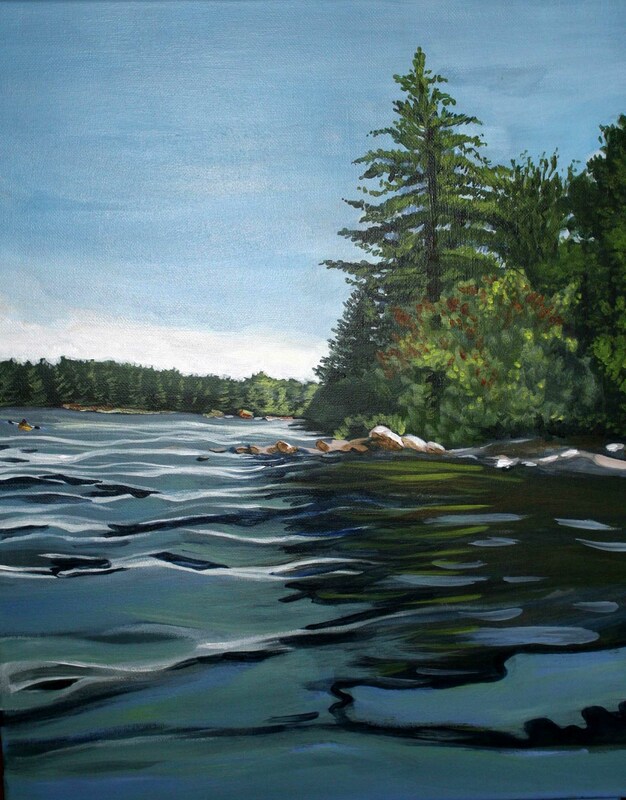 This painting also takes me to a time when I’m on vacation and spending time with family, when life slows down, and takes me to those calmer waters. It’s a nice memory. 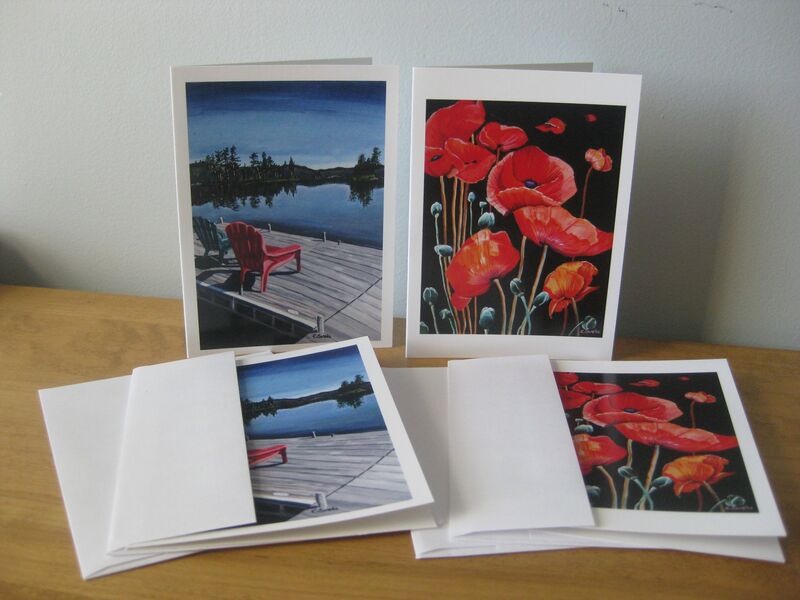 Order these attractive blank notecards, handy for everything from a personal thank you note to birthday greetings. A nice gift idea as well! $4 each or 3 for $10.00 Add $2 to cover mailing costs. Contact Cornelia at studio@corneliasvela.com with your request today! More designs now available. 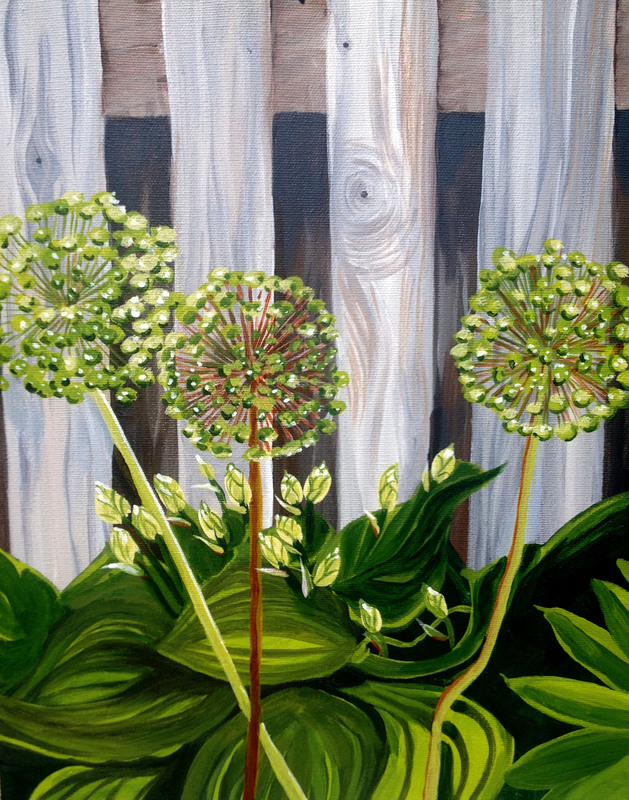 Visit Cornelia's online gallery to view her current collection for purchase. Read Cornelia's monthly blog. 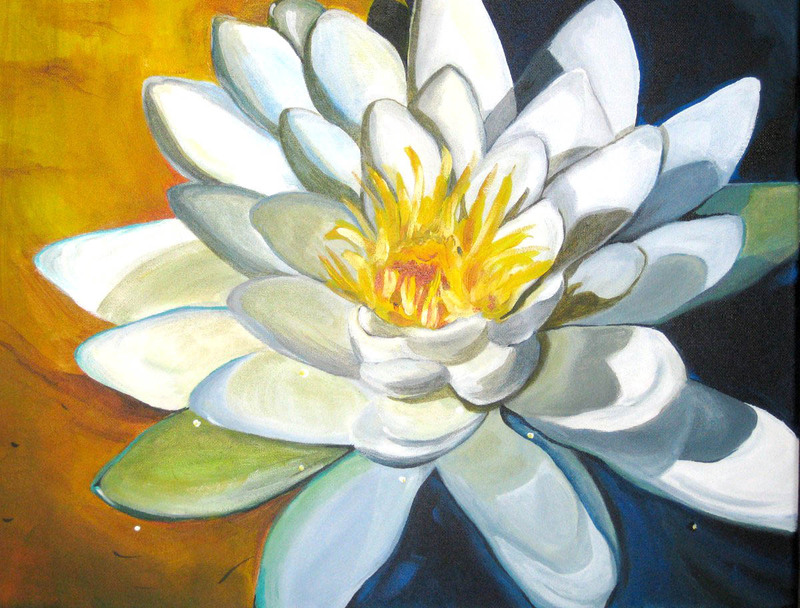 Learn art techniques, follow her work, and stay informed with art-related articles.